The word “remembering” is used loosely and imprecisely. There are actually multiple different types of memory; for example, episodic memory and semantic memory. Semantic memory: The storehouse of knowledge that we possess, but which does not involve any kind of conscious recollection. Semantic memory refers to general world knowledge that we have accumulated throughout our lives. This general knowledge (facts, ideas, meaning and concepts) is intertwined in experience and dependent on culture. 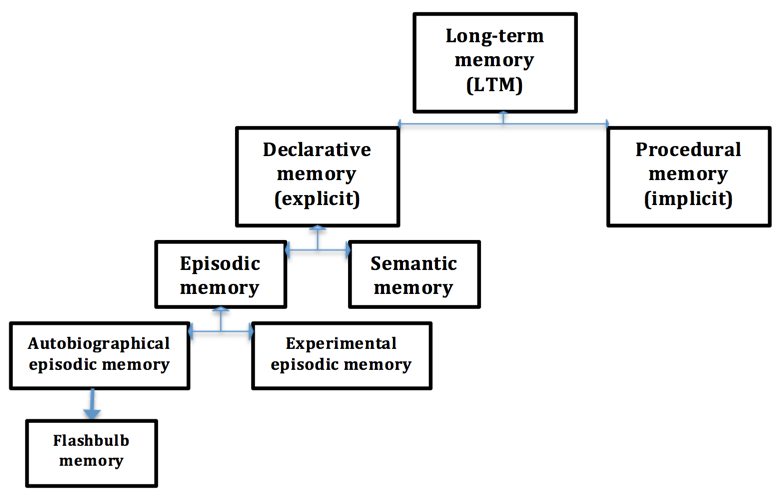 Semantic memory is distinct from episodic memory, which is our memory of experiences and specific events that occur during our lives, from which we can recreate at any given point. For instance, semantic memory might contain information about what a cat is, whereas episodic memory might contain a specific memory of petting a particular cat. We can learn about new concepts by applying our knowledge learned from things in the past. 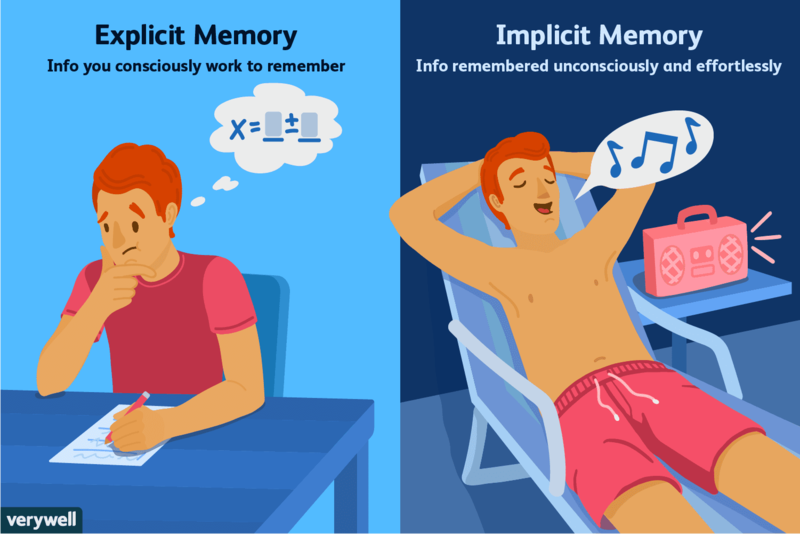 The counterpart to declarative or explicit memory is nondeclarative memory or implicit memory. Specific events: When you first set foot in the ocean. General events: What it feels like stepping into the ocean in general. This is a memory of what a personal event is generally like. It might be based on the memories of having stepped in the ocean, many times during the years. Flashbulb memories: Flashbulb memories are critical autobiographical memories about a major event. For example, if you are taking a test for school, you are probably not reminiscing about the study session you had the previous evening, or where you need to be the next class period. You are probably not thinking about your childhood, or about the fabulous career prospects that are sure to result from passing this test. Those episodic memories—inserting yourself into past or future scenarios—would probably be a hindrance from the test you are presently trying to complete. Semantic memory would be what you are drawing upon to answer the questions (hopefully correctly). It is often difficult to distinguish between one and the other. Autobiographical memories are often combinations of the two—lived experience combined with autobiographical stories and family folklore. Sometimes, we can even convince ourselves that things that didn’t happen actually did (false memories). Our autobiographical sense of self is determined by this process. Endel Tulving has described remembering as autonoetic, or self-knowing, in that one has projected one’s self into the past to re-experience some earlier episode. Simply knowing something, like the boiling point of water, is noetic, and implies no shift of consciousness. Autoneotic awareness, then, is is recursive, in that one can insert previous personal experience into present awareness. This is analogous to the embedding of phrases within phrases, or sentences within sentences. Corballis mentions that case of English musician Clive Wearing, whose hippocampus was damaged leading to anteriograde and retrograde amnesia. At the other end of the spectrum is the Russian Solomon Shereshevsky. Long-term memory can further be subdivided into implicit memory and explicit (or declarative) memory. “Implicit memories are elicited by the immediate environment, and do not involve consciousness or volition.” (p. 98) … Implicit memory…enables us to learn without any awareness that we are doing so. It is presumably more primitive in an evolutionary sense than is explicit memory, which is made up of semantic and episodic memory. 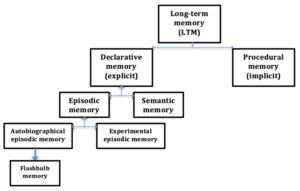 Explicit memory is sometimes called declarative memory because it is the kind of memory we can talk about or declare. The textbook case of implicit memory is riding a bicycle. You don’t think about, or ponder how to do it, you just do it. 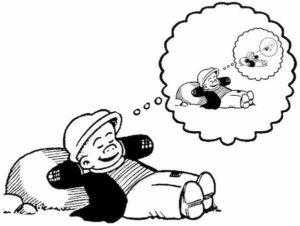 No amount of intellectual thought and pondering and thinking through your options will help you to swim or ride a bike or play the piano. When a line drive is hit to the shortstop, implicit memory, not explicit memory catches the ball (although the catch might provide a nice explicit memory for the shortstop later on). A daydreaming shortstop wold miss the ball completely. Operant conditioning (also called signal learning, solution learning, or instrumental learning) is another type of learning that does not require conscious, deliberative thought. It is a simple stimulus and response. You touch the stove, and you know the stove is hot. There was no thinking involved when Pavlov’s dogs salivated at the sound of a bell, for example. In a very unethical experiment, the behaviorist John B. Watson took a nine-month old orphan and conditioned him to be afraid of rats, rabbits, moneys, dogs and masks. He did this by making a loud, sharp noise (banging a metal bar with a hammer), which the child was afraid of, whenever the child was presented with those things. By associating the sound with the stimulus, he was able to induce a fear of those items. But there was no volition; no conscious thought was involved in this process. It works the same way on dogs, rabbits, humans or fruit flies. Behvariorism tells us next to nothing about human consciousness, or what makes us different. This important distinction is what is behind Jaynes’s declaration that learning and remembering do not require consciousness. Implicit memory and operant conditioning do not require the kind of deliberative self-consciousness or “analog I” that Jaynes described. Even explicit memory—the ability to recall facts and details, for example—does not, strictly speaking, require deliberative self-consciousness. Clive Wearing, referred to above, could still remember how to play the piano, despite living in an “eternal present.” Thus, it is entirely possible that things such as ruminative self-consciousness emerged quite late in human history. Jaynes himself described why consciousness (as distinct from simply being functional and awake) is not required for learning, and can even be detrimental to it. The learning of complex skills is no different in this respect. Typewriting has been extensively studied, it generally being agreed in the worlds of one experimenter “that all adaptations and short cuts in methods were unconsciously made, that is, fallen into by the learners quite unintentionally.” The learners suddenly noticed that they were doing certain parts of the work in a new and better way. But we not only use our memory to recall past experiences, we also think about future events as well, and this is based on the same ability to mentally time travel. It may seem paradoxical to think of memory as having anything to do with events that haven’t happened yet, but brain scans show that similar areas of the brain are activated when recalling past events and envisioning future ones—particularly the prefrontal cortex, but also parts of the medial temporal lobe. There is slightly more activity in imagining future events, probably due to the increased creativity required of this activity. One important aspect of episodic memory is that it locates events in time. Although we are often not clear precisely when remembered events happened, we usually have at least a rough idea, and this is sufficient to give rise to the general understanding of time itself. It appears that locating events in time and in space are related. Episodic memory allows us to travel back in time, and consciously relive previous experiences. Thomas Suddendorf called this mental time travel, and made the important suggestion that mental time travel allows us to imagine future events as well as remember past ones. It also adds to the recursive possibilities; I might remember, for example, that yesterday I had plans to go to the beach tomorrow.The true significance of episodic memory, then is that it provides a vocabulary from which to construct future events, and so fine-tune our lives. Once again, the usefulness of this will be determined by the social environment. I will argue later that this ability to mentally time travel, as with the ability to “read minds” (which we’ll talk about next) became more and more adaptive over time as societies became more complex. For example, it would play little to no role among immediate return hunter gatherers (such as the Pirahã), who live mostly in the present and do not have large surpluses. Among delayed return hunter gatherers and horticulturalists, however, it would play a far larger role. When we get to complex foragers and beyond, however, the ability to plan for the future becomes almost like a super-power. And here, we see a connection I will make between recursion and the Feasting Theory we’ve previously discussed. Simply put, an enhanced sense of future states allows one to more effectively ensnare people in webs of debt and obligation, which can then be leveraged to gain wealth and social advantage. I will argue that this is what allowed the primordial inequalities to form in various societies which could produce surpluses of wealth. 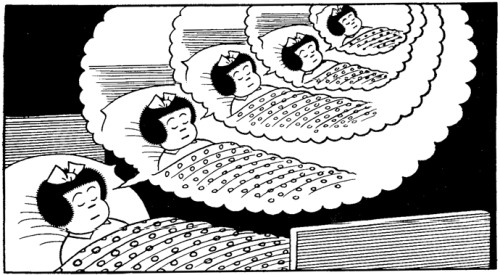 It also demonstrates the evolutionary advantages of recursive thinking. Corballis then ties together language and mental time travel. He posits that the recursive nature of language evolved specifically to allow us to share past and future experiences. It allows us to narratize our lives, and to tell that story to others, and perhaps more importantly, to ourselves. Language allows us to construct things that don’t exist—shared fictions. It allows us to tell fictional stories of both the past and the future. The mental faculties that allow us to locate, sort and retrieve events in time, are apparently use the same ones that we use to locate things in space. Languages have verb tenses that describe when things took place (although a few languages lack this ability). The ability to range at will over past, present and future gave rise to stories, which are often the glue that holds societies together, such as origin stories or tales of distant ancestors. Is the image above truly about moving forward in space, or is it about something else? 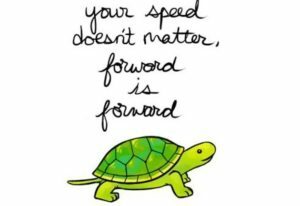 What does it mean to say things like we “move forward” after a tragedy? Different sets of grid cells form different grids: grids with larger or smaller hexagons, grids oriented in other directions, grids offset from one another. Together, the grid cells map every spatial position in an environment, and any particular location is represented by a unique combination of grid cells’ firing patterns. The single point where various grids overlap tells the brain where the body must be…Since the grid network is based on relative relations, it could, at least in theory, represent not only a lot of information but a lot of different types of information, too. “What the grid cell captures is the dynamic instantiation of the most stable solution of physics,” said György Buzsáki, a neuroscientist at New York University’s School of Medicine: “the hexagon.” Perhaps nature arrived at just such a solution to enable the brain to represent, using grid cells, any structured relationship, from maps of word meanings to maps of future plans. …the evolution of language itself is intimately connected with the evolution of mental time travel. Language is exquisitely designed to express ‘who did what to whom, what is true of what, where, when and why’…and these are precisely the qualities needed to recount episodic memories. The same applies to the expression of future events—who will do what to whom, or what will happen to what, where, when and why, and what are we going to do about it…To a large extent, then, the stuff of mental time travel is also the stuff of language. Language allows personal episodes and plans to be shared, enhancing the ability to plan and construct viable futures. To do so, though, requires ways of representing the elements of episodes: people; objects; actions; qualities; times of occurrence; and so forth…The recounting of mental time travel places a considerable and, perhaps, uniquely human burden on communication, since there must be ways of referring to different points in time—past, present and future—and to locations other than that of the present. Different cultures have solved these problems in different ways. Many languages use tense as a way of modifying verbs to indicate the time of an episode, and to make other temporal distinctions, such as that between continuous action and completed action. Some languages, such as Chinese, have no tenses, but indicate time through other means, such as adverbs or aspect markers. The language spoken by the Pirahã, a tribe of some 200 people in Brazil, has only a very primitive way of talking about relative time, in the form of two tense-like morphemes, which seem to indicate simply whether an event is in the present or not, and Pirahã are said to live largely in the present. Reference to space may have a basis in hippocampal function; as noted earlier, current theories suggest that the hippocampus provides the mechanism for the retrieval of memories based on spatial cues. It has also been suggested that, in humans, the hippocampus may encompass temporal coding, perhaps through analogy with space; thus, most prepositions referring to time are borrowed from those referring to space. In English, for example, words such as at, about, around, between, among, along, across, opposite, against, from, to and through are fundamentally spatial, but are also employed to refer to time, although a few, such as since or until, apply only to the time dimension. It has been suggested that the hippocampus may have undergone modification in human evolution, such that the right hippocampus is responsible for the retrieval of spatial information, and the left for temporal (episodic or autobiographical) information. It remains unclear whether the left hippocampal specialization is a consequence of left hemispheric specialization for language, or of the incorporation of time into human consciousness of past and future, but either way it reinforces the link between language and mental time travel. The most striking parallel between language and mental time travel has to do with generativity. We generate episodes from basic vocabularies of events, just as we generate sentences to describe them. It is the properties of generativity and recursiveness that, perhaps, most clearly single out language as a uniquely human capacity. The rules governing the generation of sentences about episodes must depend partly on the way in which the episodes themselves are constructed, but added rules are required by the constraints of the communication medium itself. Speech, for example, requires that the account of an event that is structured in space–time be linearized, or reduced to a temporal sequence of events. Sign languages allow more freedom to incorporate spatial as well as temporal structure, but still require conventions. For example, in American sign language, the time at which an event occurred is indicated spatially, with the continuum of past to future running from behind the body to the front of the body. Of course, language is not wholly dependent on mental time travel. We can talk freely about semantic knowledge without reference to events in time… However, it is mental time travel that forced communication to incorporate the time dimension, and to deal with reference to elements of the world, and combinations of those elements, that are not immediately available to the senses. It is these factors, we suggest, that were in large part responsible for the development of grammars. Given the variety of ways in which grammars are constructed, such as the different ways in which time is marked in different languages, we suspect that grammar is not so much a product of some innately determined universal grammar as it is a product of culture and human ingenuity, constrained by brain structure. Next time, we’ll take a look at another unique recursive ability of the human mind: the ability to infer the thoughts and emotions of other people, a.k.a. the Theory of Mind.